A timed road bicycle event up and over the La Sal Loop road. The La Sal Mountain Loop Road features an amazing variety of canyon country scenery. The 65-mile long route follows the Colorado River for a while, then it heads to the La Sal Mountains through beautiful Castle Valley. The route through La Sals provides incredible views of the 12,000+ foot peaks and the red rock valleys far below. Finishing the loop takes one back to Moab via Spanish Valley Drive. Lunch is provided at the finish, Old City Park. 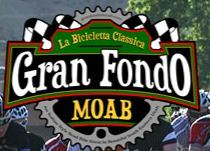 Go to http://www.granfondomoab.com for more details.